If you would like to adopt a companion bird or are considering relinquishing your parrot, Free Flight Exotic Bird Sanctuary is here to help. If you would like to adopt a companion bird or are considering relinquishing your parrot, Free Flight is here to help. We carefully evaluate each bird and prospective adoptive family to ensure mutual bonding and suitability. Sponsoring a parrot can be very rewarding for those of us who are not in a position to have a parrot in their home. Additionally, we offer boarding, grooming and behavioral consultation for your companion bird in a safe, stimulating tropical environment. Are you thinking about adding a bird to your family? Consider adoption - due to the longevity of most species of parrots, it’s inevitable that at some point many parrots will be in need of a new home. Why not make it yours! Free Flight’s experienced staff can help you find the right companion to ensure bonding with you and your family. Our companion parrot placement success is directly related to our philosophy of requiring multiple visits to the sanctuary for bonding, re-socialization by daily interaction with our staff and visitors, as well as careful evaluation and screening of the prospective adopters by each member of our trained staff. This is the most important component in our adoption program and we have several membership options to make this easier. We want to get to know you, but most importantly, we need our birds to get to know you. Building a strong, trusting relationship between human and bird is essential and watching this process is how we assess if you are a compatible companion for one of our parrots. An average adoption will take 3+ months of visitation. Not all our birds are adoptable, and some require much more experience than others. 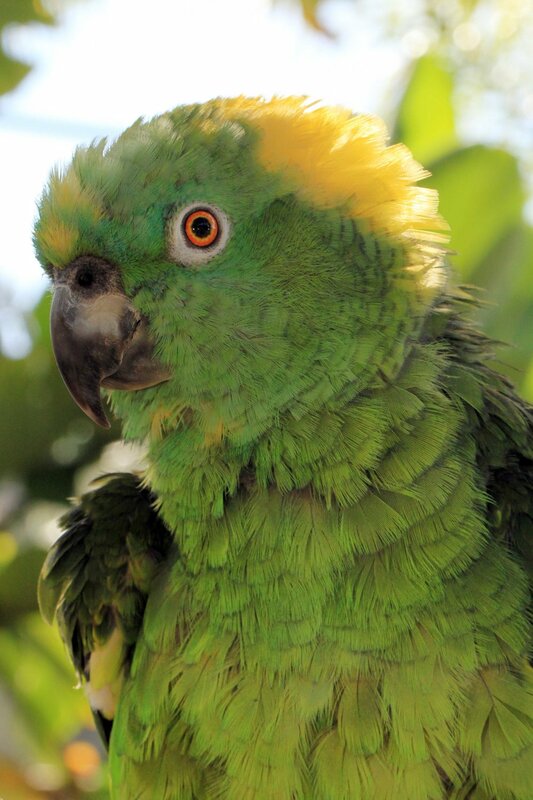 We want to be sure you know the unique personality and needs of each parrot before adoption can be considered. WE DO NOT SELL OR SHIP PARROTS, AND WE DO NOT MAKE EXCEPTIONS TO OUR ADOPTION VISITATION PLAN AS DESCRIBED ABOVE. PLEASE DO NOT ASK. Many Of Our Birds Come To Us Through Relinquishment. Most birds can be re-socialized and put up for adoption, others would do better to live out their lives in the sanctuary visiting with the public and participating in our programs. When Free Flight is contacted to help, our primary concern is how we can best help a particular bird. We understand saying goodbye to a family member can be difficult. We find that companion parrot relinquishment occurs most often when an owner’s health or domestic situation has changed and they can no longer properly care for their bird. When parrots suffer a loss, they go through a time of grieving similar to that of human beings. The grief period and re-socialization process usually take from 6 to 24 months, and only after this period can a bird be considered for a successful adoption. Realistically it can take 2 to 5 years for a bird to find the right new family. We ask for a relinquishment fee to help cover our expenses for regular care and a veterinary checkup. In the event a bird will not be put up for adoption, further financial arrangements will need to be discussed. If you are in need of relinquishing a companion bird, you can get started by clicking here. Plan ahead options to cover the care of your companion bird. If you would like to help, please give us a call at 858-481-3148 or check out donation options now! You just may end up adopting the special parrot that you sponsor as others have. Both the happiest and saddest days at Free Flight are when one of our flock leaves to start life in his new home. We place about 15 previously relinquished birds a year. In the last 6 years we have only had 2 return. We are very proud of our track record of successfully matching our birds with new families.